This article explains some of the common causes of shoulder pain, as well as some general treatment options. Your doctor can give you more detailed information about your shoulder pain. 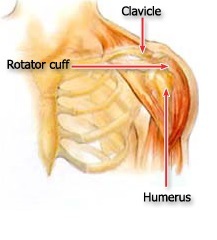 This simplified illustration of the shoulder highlights the major components of the joint. Other much less common causes of shoulder pain are tumors, infection, and nerve-related problems. Shoulder impingement occurs when the top of the shoulder blade (acromion) puts pressure on the underlying soft tissues when the arm is lifted away from the body. As the arm is lifted, the acromion rubs, or "impinges" on, the rotator cuff tendons and bursa. This can lead to bursitis and tendinitis, causing pain and limiting movement. Over time, severe impingement can even lead to a rotator cuff tear. Shoulder pain can also result from arthritis. There are many types of arthritis. The most common type of arthritis in the shoulder is osteoarthritis, also known as "wear and tear" arthritis. Symptoms, such as swelling, pain, and stiffness, typically begin during middle age. Osteoarthritis develops slowly and the pain it causes worsens over time. In the case of an acute injury causing intense pain, seek medical care as soon as possible. If the pain is less severe, it may be safe to rest a few days to see if time will resolve the problem. If symptoms persist, see a doctor. Your doctor will conduct a thorough evaluation in order to determine the cause of your shoulder pain and provide you with treatment options. Your doctor may order specific tests to help identify the cause of your pain and any other problems. Electrical studies. Your doctor may order a tests, such as the EMG (electromyogram), to evaluate nerve function. Arthroscopy. In this surgical procedure, your doctor looks inside the joint with a fiber-optic camera. Arthroscopy may show soft tissue injuries that are not apparent from the physical examination, x-rays, and other tests. In addition to helping find the cause of pain, arthroscopy may be used to correct the problem. Treatment generally involves rest, altering your activities, and physical therapy to help you improve shoulder strength and flexibility. Common sense solutions such as avoiding overexertion or overdoing activities in which you normally do not participate can help to prevent shoulder pain.